Has anyone ever made a good macaroni & cheese that involved tomatoes? I have had multitudes of problems with this. I can make a very good macaroni & cheese casserole/bake-type-thing using Italian cheeses, and I have added meat previously without having a problem. Throwing in the tomatoes, though, results in the sauce being a bit weird and kind of separated. It tastes good but looks really odd and doesn't seem to thicken up consistently. I wondered if it was the acid in the tomatoes versus the cream BUT vodka sauce. Suggestions? I don't know why I'm determined to do this with tomatoes. You can also just post your macaroni and cheese recipes if you want. I think you could use a roux to hold the stability of the cheese. That parmesan sauce I've been blabbering on about the last couple of days is remarkably smooth and velvety even over direct heat. You could make a similar sauce with cheddar or whatever cheese you want in your mac&cheese. Take account of the amt. of water in the tomatoes you'll be adding, of course. Or, there's the lesson of Rotel Cheese Dip: you could use half Velveeta for stability and half a sharper cheese for flavor. I bet macaroni and cheese made with Rotel cheese dip + cheddar would be bomb-diggety. Uh, I guess that was more or less saying the same thing twice. The second time was meant to be more like, "hmmm, I think I'll try that." I wonder if it isn't the water in the tomatoes that's destabilizing the sauce. Draining them really well, to the point of gently pressing the moisture out, might help. Or, try sun-dried tomatoes - not the same for either flavor or texture though. Something about this is tickling my brain re: Harold McGee's On Food and Cooking. Something about temperatures and acidity and whatnot w/r/t cheese sauce. But there are 2 WHOLE HOURS of work left! If the acid is coagulating your cheeses' proteins, maybe change up your cheese situation: something that's softer at room temperature, like fontina or nonfresh mozzarella, is going to hang together in a crisis better than a harder cheese. Cook it at a super low temperature too. Or a teaspoon of milk of magnesia melted into the cheese will combat the tomatoes' acidity and make your casserole deliciously digestible. Are you making a milky sauce with your cheeses? Try reducing that liquid to make room for tomato liquid. The roux approach or just more fat would tend to stabilize your sauce too. What order are you doing things in? See if you can get the cheese to cling to the macaroni the way you want it to first, then add the tomatoes; or else see if you can create a stable cheese sauce that incorporates tomatoes first, then dress your noodles with it. Or do a layering approach so if the tomatoes and the cheese are gonna fight they don't have to sit next to each other. Here are 256 recipes for mac + cheese + tomatoes. There doesn't seem to be any one trick I can extrapolate from them on a quick browse though. Ally, the trick is to roast the tomatoes in the oven. I took this recipe out of Ready Made Magazine. It's really swell. Heat oven to 450. Roast the tomatoes + onions for 20 minutes. Meanwhile, grease an 8x8 caserole dish (or equivalent) with a little bit of the butter. Reduce heat to 350 after tomatoes and onions are done. Cook macaroni and drain. Melt butter over medium-low, add flour until deep golden brown. Stir in milk, bring to boil over medium-high, stir constantly until thickens (about 5 minutes). Remove from heat, add grated cheddar. Add gorgonzola, basil, tomatoes and onions, stir a little. Put in greased caserole dish and sprinkle bread crumb mixture over it. Cook in over for 30 minutes. Enjoy. Also, I forgot two things in that recipe. 1) I think the oil is intended for greasing the casserole dish. I just use butter instead. 2) VERY IMPORTANT: After you add the milk to the butter-flour mixture, also add a dash of tabasco, black pepper to taste and 1tsp of cayenne pepper. I guess this is the "mad" part. A bit of mustard in the cheese sauce always works a treat too. Like I said, it tastes good but it just looks...funky, until I bake it (I bake it with extra cheese thrown in so maybe that helps gel it together, god only knows). These are all good suggestions tho and that recipe sounds good! The McGee book made it sound like high temps are more problematic with cheese sauce than the acidity. I read it, then we watched American Idol, and I forgot all about posting it! It could work just to do your sauteables in one pan while you make your cheese sauce in another, then add pan A to pan B somewhat slowly. If the cheese is already milky and melted, ideally with roux or butter or some other stabilizer, it shouldn't freak out too much when the tomatoes hit it even if they're hot. Oh, I always use a pretty hefty amount of butter. I will try separating them though, cos yeah it always seems to be the case that if it's already basically "done" you can't mess it up too badly. That's a good idea! It will have to wait until post-marriage though because I don't currently have proper pots. When's the wedding Ally? Did you guys register for lots of kitchen stuff? out with the old, in with the new is great! When our kids moved out, I gifted them kitchen stuff and I got replacements. You can never really have enough oven mitts and kitchen towels. True...sorry to derail this thread but my oven mitts from only a year or so ago are already turning into a bit of a mess. I am v. sloppy though sometimes. And I'm not v. careful with things at all (throwing pots and pans in the dishwasher, not checking first to see if things are safe for that, using the mitts to sometimes wipe up spills if I'm doing too many things at once to properly clean up, etc)! So I figure replacing everything is a good idea. I'm really, really bad at keeping kitchen ware in "pretty" condition...like definitely still usable condition but all my cook/bake ware looks like hell on wheels. I got some of those silicone oven mitts a few months back! They are great because you can throw them in the dishwasher! They are terrible because they don't have enough flex so you don't feel like your grip is secure! Ally, you need one of these, one of these, and a pair of these. Yeah, the silicone mitts are annoying for holding casseroles and such, but they're great for grabbing drumsticks out of boiling oil and other circusy tricks. Paul, your suggestions...confuse me a little. Maybe you can do without a Stick Drench System for now. But the Robot-Gun? Never put food on a plate again -- just shoot it across the room at your delighted husband! Did you want another quenelle, honey? BLAM! Wow! I want one of those giant stockpots, but my kitchen isn't big enough. Maybe a wiser approach would be to fit your kitchen inside the pot. I was thinking I could stand in it to cook when I wasn't using it. With the lid strapped to my back like a turtle shell. It would take $350 worth of gas to bring a $350 stock pot full of water to a boil. 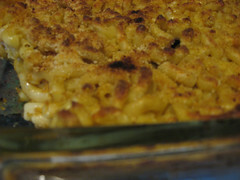 To get this back on the macaroni track - Ally, what italian cheeses go in your mac & cheese? You should see our PB&J Manifesto. The Little Red recipe Book. Oh honestly I don't have specific ones I use each time. I think last time was parm-reg, a little provolone, asagio, and actually a little bit of robusto as well but that was mainly because I had it and wanted to use. I like slices of tomato arranged on top of mac and cheese before baking in the oven. It looks pretty. I have a good tomato cheesy bake that works very well: its a bit like what Rock suggested at the top of thread, the key is white sauce (bechamel sauce). Which frankly I thought mac n cheese was anyway? Anyhoo. What I do is: I make a basic bechamel sauce, can be thin or thick depending on yr preference. Chuck in some tasty or parmesan cheese as you like and melt thru. Meantime, rather than just add tomatoes I actually cook a tomato sauce like I would for pasta. Fry off onion and garlic, add canned tomatoes and paste, cook for abt 10 minutes to reduce. If you liked you could toss in some veg such as carrot, peas, or broccoli too. Then gently stir the bechamel into the tomato sauce and stir it til its all well mixed, toss that into yr cooked pasta, add some more cheese, top it with a thick layer of cheese and breadcrumbs, and bake til thats crusty (maybe 15 mins or so). You could add chopped boiled egg too. Its delish: its a bit like an italian pasta al forno I suppose, tho I dont think that usually has bechamel stirred into it. Oh that does sound good, that's a good idea. The Le Creuset pans finally showed up. 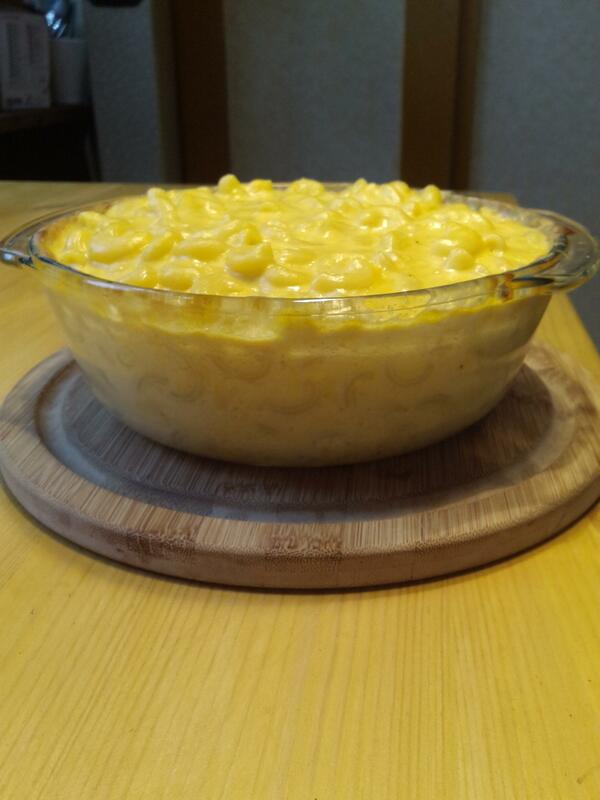 When we get back from travelling, I'm making mac & cheese first thing in the 3-qt soup dish. this is just disgusting. it lays waste to a perfectly simple combination of foods. our forefathers were onto something. the tomato is a practically worthless fruit good for nothing more than pizza sauce, & half the time thats not so great either. this thread makes me sick. Well, I feel sorry for you, a little bit. But mostly I'm thinking "excellent! more for me!" I've got an Early girl and a Large Yellow plant in containers out front, as well as 2 tomatillo plants which are already setting fruit. Had 6 sweet basil plants, one of which mysteriously withered away (and a second seems to be doing the same now - I may have overwatered), 2 of opal basil which are doing okay, and 1 Thai holy basil which is happy as can be. Jaq, I've had problems growing sweet basil too - I can't find any rhyme or reason as to why one dies while the others flourish happily. Growing that and some Sun Gold tomatoes on my windowsill at the moment. Come July my living room is going to smell like tomato salad (i.e. the best summer smell ever). Jaq, I'm so jealous yours are fruiting already! i made a huge pan of mac and cheese last weekend, using "sharp" cheddar and gruyere. great, but i would have liked it to be a bit more tangy. has anybody noticed that "deej" "deeznuts" and "dean ge" all seem to have the same bad attitude about everything? hejira, only my tomatillos have fruits at this point. I've never tried to grow them here (Seattle), but am hoping for the best. The yard gets more afternoon sun than I thought it would - the ficus tree I moved outside has gotten sunburnt! Jaq - poor ficus tree; I guess calamine lotion doesn't work like it does on people? I am jealous of any fruit at all! My Sun Gold are about two feet high on the cane, and although looking fab they're nowhere near fruiting. I'm collecting some rain from today's TORRENTIAL downpouring (UK law states that it must rain heavily on the first day of Wimbledon) so I'll use that on them to make them feel like they're outside (this is the ridiculous way my mind works). Back to mac 'n' cheese - can't say I'm a huge fan. It looks kinda like a half-finished lasagne to me and my subconscious goes "hey! where's the meat?" A friend of mine won the Northwest Regional division of the Tillamook Mac&Cheese contest this year! She's going to the finals on Dec 7 (at the Lucia (?) hotel in Portland, where they live anyway). GO V.!!!! Secondly, I want one of these "edge" pans (http://www.eugeneweekly.com/2007/07/26/chow/features7.html), both for mac&cheese and brownies. i posted on ile about wanting that pan for my birthday. it looks awesome. Mac & Cheese in the oven *right now*. It's Nigel Slater's recipe from Kitchen Diaries, with Fontina, Pecorino, breadcrumbs, dijon mustard and grain mustard. Will report back, but the spoon-licking bodes well for the finished item. I don't half wish I had one of those pans. Hmmm. The topping was marvellous - a 50/50 mix of pecorino and breadcrumbs - but the stuff underneath was only OK. Not nearly cheesy enough for my liking. Sorry Nige. Did it need more cheese d'ya think, or just different cheese? I came home last night w/ a big mac&cheese craving to a fridge full of cheese, but no pasta to be found. The loaf of bread I baked on Sunday will make terrific crumbs in a few more days though, so I'm planning a big pan of golden cheesy buttery goodness for the weekend. The Fontina was pretty pokey, but I don't think 75g was enough (for 175g of pasta). If I did it again I'd use twice as much. Also, you couldn't tell there was mustard in it, really, apart from grainy speckling. i made the cauliflower cheese last night. it was wicked. My cheese sauce broke and was grainy last time. Tasted fine but looked & felt odd. I haven't really investigated why yet, maybe I used too much hard cheese? Maybe too much heat, maybe lots of things. The cookbook wasn't very scientific about the recipe, I'm afraid. So much better than my old bechamel-based recipe. Repeated stirring & adding milk & cheese is key. Forgot the bread crumbs, obvs.